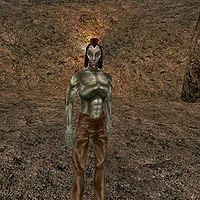 Hannat Zainsubani is a Dunmer thief and the son of Hassour in Ald'ruhn. He was last heard of when he left to chart the underground complex of Mamaea, and his father worries about him. His only remaining possession is the pair of common pants he wears. Aside from his natural resistance to fire and the sanctuary provided by his ancestors, he knows no spells. It is interesting to note that Hannat is, for whatever reason, one of the highest ranking Thieves Guild members. Despite this, the rest of the Thieves Guild members (excluding his father) don't seem to care about him or even acknowledge his existence. This page was last modified on 6 January 2014, at 05:18.